We often get asked the question: “Who are your main competitors?”. We used to say that we did not have any direct competitors. Yes, you read that right. Sure, there was a competitive landscape, but despite earlier attempts by Google, HERE, ESRI and more, no other company was offering the same product as us. There’s a common belief that having no competitors either means that your product isn’t valuable enough, or it’s way ahead of the market. According to Google Maps, they “highlight the areas with the highest concentration of restaurants, bars and shops”. 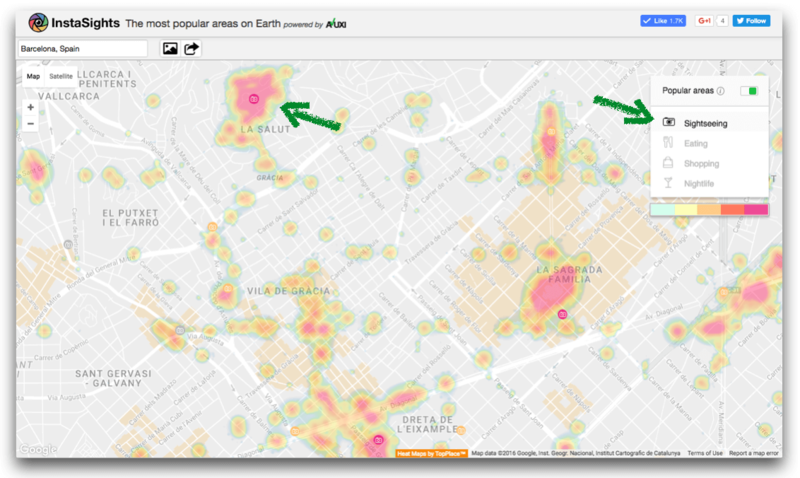 Well, during our past product iterations we learned that using concentration of venues and/or foot traffic as a criteria to identify popular city hotspots is often misleading. This humorous post reviews the new Google Maps feature in London, and illustrates this point well. It goes to show why we focus on evaluating people’s interest when we generate our Areas of Interest – not just concentration of venues or amount of foot traffic. In TopPlace we differentiate between activity types. In Google Maps, nightlife, shopping and restaurants are all clumped together, which makes it difficult to find exactly what you are looking for. Furthermore, Google Maps doesn’t highlight important sightseeing areas (notice Park Güell, pointed with an arrow in the graphic below), so travelers using the maps application may miss a relevant component of their trip (79% travel to experience new places). To offer a comparison of our product with Google’s, we decided to push an early release of our new demo version of worldwide Areas of Interest. While it’s still an alpha version, it already shows more detailed results than our previous version. 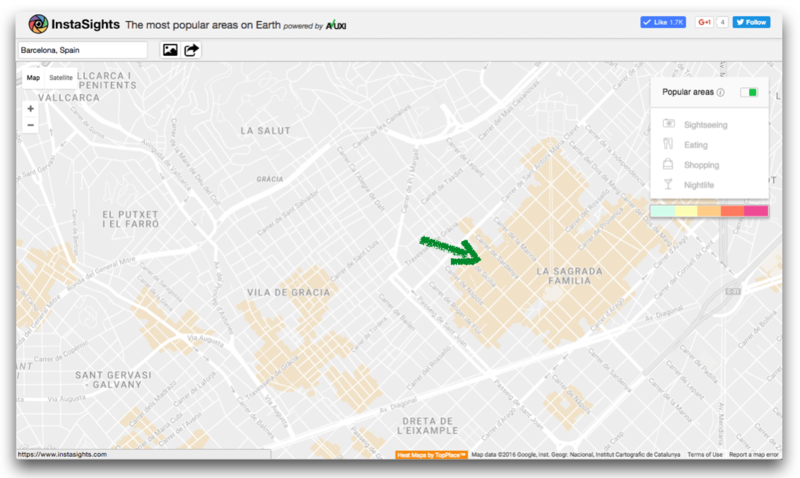 AVUXI’s TopPlace shows also very popular Sightseeing areas (not highlighted on Google Maps), like the famous Park Güell in Barcelona. 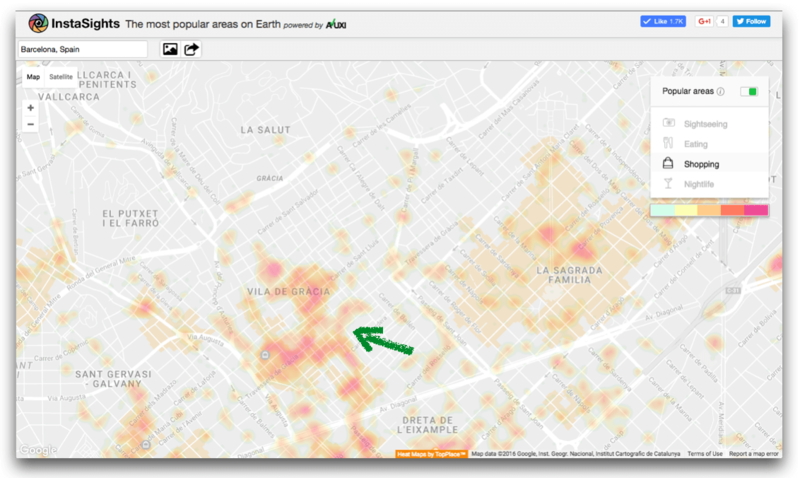 Popular Shopping areas by TopPlace: Vila de Gracia is a smaller “area of interest” on Google, but according to TopPlace it has more popular shopping hotspots than there is in the “larger” Sagrada Familia area. We happen to have an office in Barcelona and know for a fact that there are not many interesting hotspots around La Sagrada Familia basilica. You can search through many other cities and find similar inconsistencies from Google Maps. This insightful post on Slate.com even argues that Google is biased on purpose. Worldwide coverage: TopPlace vs Google Maps comparison – Ulaanbaatar, Mongolia. We are proud to have developed a more meaningful method of uncovering true Areas of Interest. While we expect Google to continue improving their new map results, we already have new valuable products and updates coming up.